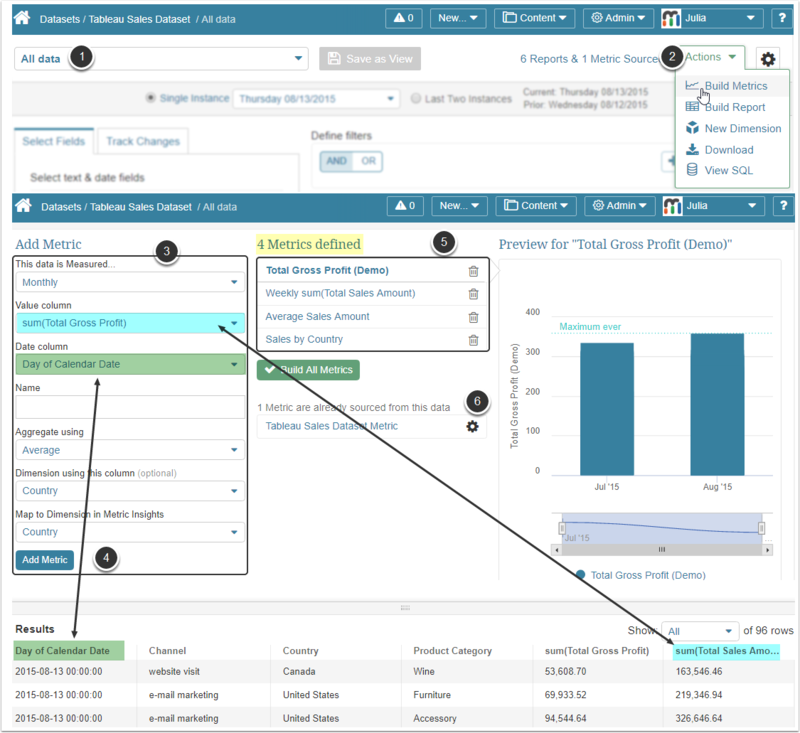 Our team is fired up and ready to launch Metric Insights Version 5.1. This time we have invested heavily into Alerting automation, specifically, managing Alerts via Workflows which are going to serve for keeping the history of Alert cases, users who are assigned issue handling and overall resolution outcome. Also, User Maps are no longer used exclusively for Datasets - the process of mass subscribing Users to KPI Alerts has been enhanced by an ability to apply User Maps to them. Report Alerts have been revamped dramatically as well - subscribing to Report updates can be now done in seconds. We also offer easier and quicker ways of creating new Metrics: bulk Metric creation from Datasets or creating Metrics and other objects from templates. These methods are designed to save hours of your time since the majority of settings are going to be populated automatically. Check out the full list of improvements and updates in this article. [5.1.2] Dimensions: Sourcing Reports from "Existing Datasets - SQL"
Metric Insights offers a variety of options for automating data analysis (KPI Alerts, Global Alerts, Report Notifications, Statistical calculations) and delivering instant or digest notifications on data anomalies to users' devices. Our philosophy is simple: whenever there is a chance to delegate data anomaly detection to a machine, it should be done. This strategy helps saving thousands of working hours and reduce costly "human factor" mistakes. Instead of logging to the tool that stores data, finding the required Dashboard, Visualization or a Report, Users can subscribe to the elements which hold the data required for their responsibility scope and set the criteria for "good" and "bad" scenarios. Next, if the Alert condition is met, those Users are notified about them either immediately or upon their notification delivery schedule. No unnecessary actions, no wasted time. Issue. But what happens after the Alert fires and is delivered to the Recipients? Typically, what follows is left behind the scene: Who took care of an Issue? How was it fixed? Was it an accident or a trend which may influence company efficiency? All this information is valuable both for seeking short and long-term solutions and should not be lost in emails and messengers. We offer a way to tie this information to a respective Chart and right to the generated Alert which is a powerful way of making it accessible to all the involved Users and keeping the history of actions taken further. 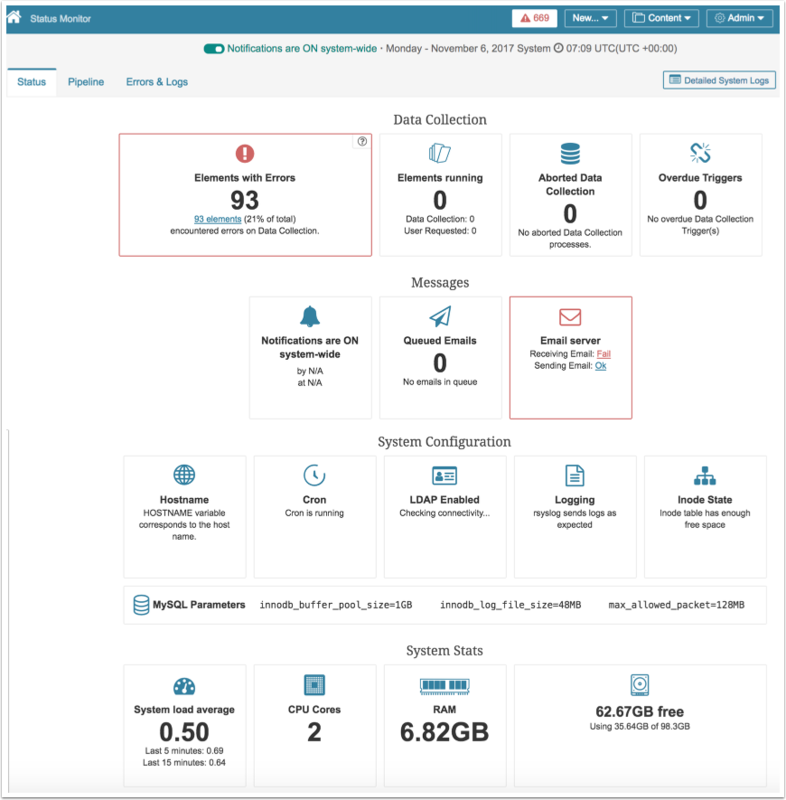 Solution: In Release 5.1 we introduce Alerts Management functionality, which implies optional assigning of predefined Workflows to generated Alerts. 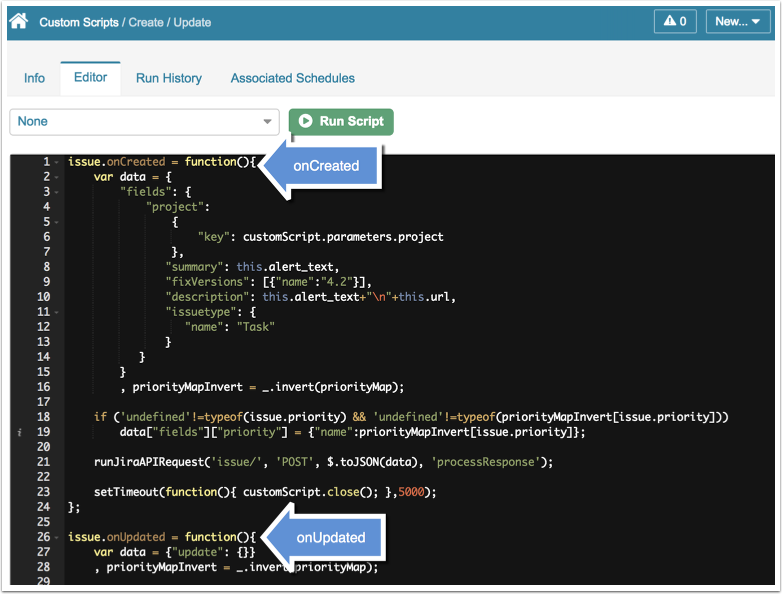 Assign an Alert Workflow to a KPI Alert Rule (either while the Alert is created or to an existing Alert in the KPI Alert Editor > Subscriptions & Alert Workflows. 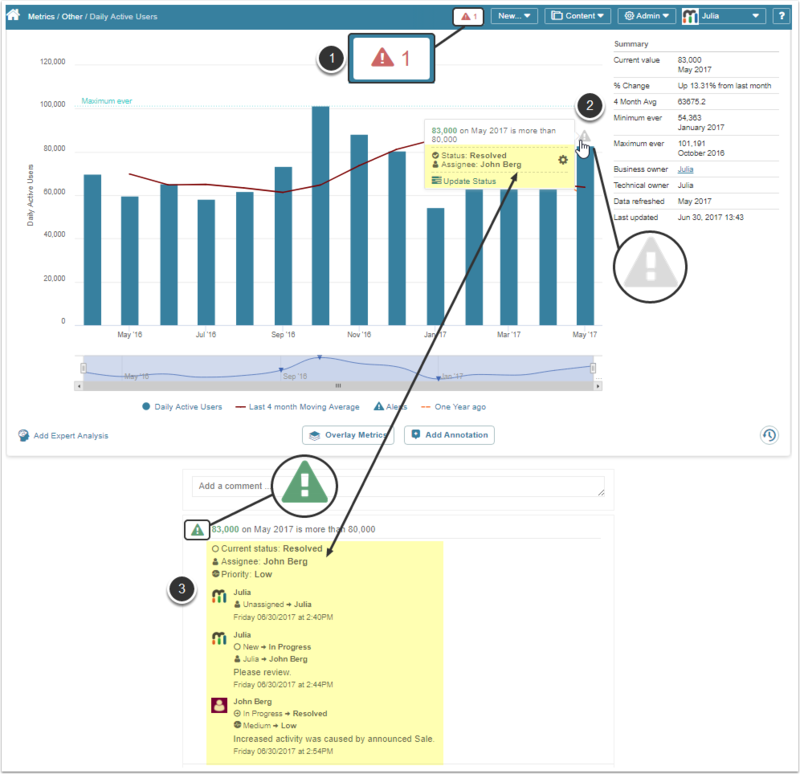 When the data which meets the Alert criteria is collected and the Alert is generated, an Alert case is added to the Chart and below it into the Comments section. To change an Assignee or Status, click Update Status (shown in the picture below). onCreated: Fired when an issue is created in the Metric Insights and passes issue details to share it with an integrated system. onUpdated: Fired when an issue is updated at any site (either Metric Insights or the 3rd party system) and is aimed at synchronizing issue content (for example, "issue.priority"). In previous versions, to mass subscribe multiple users to an Alert Rule, Administrators could use Group Subscription. This is an easy way, but it is a unified method which has no flexibility for customization, which might be helpful when different users have a different scope of responsibility. This new feature will come in handy for Dimensioned Metrics. 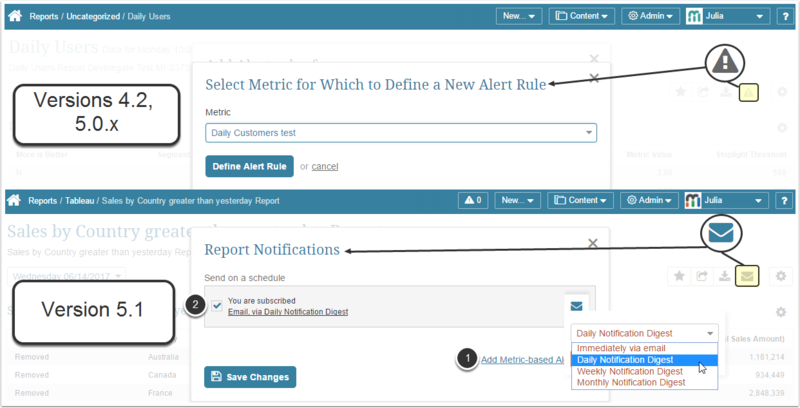 Instead of defining every User's scope of access in each new Alert Rule, you can determine it once in a User Map and apply it to the subsequent Alerts. Click [+ Edit User Map Access]. A pop-up opens. 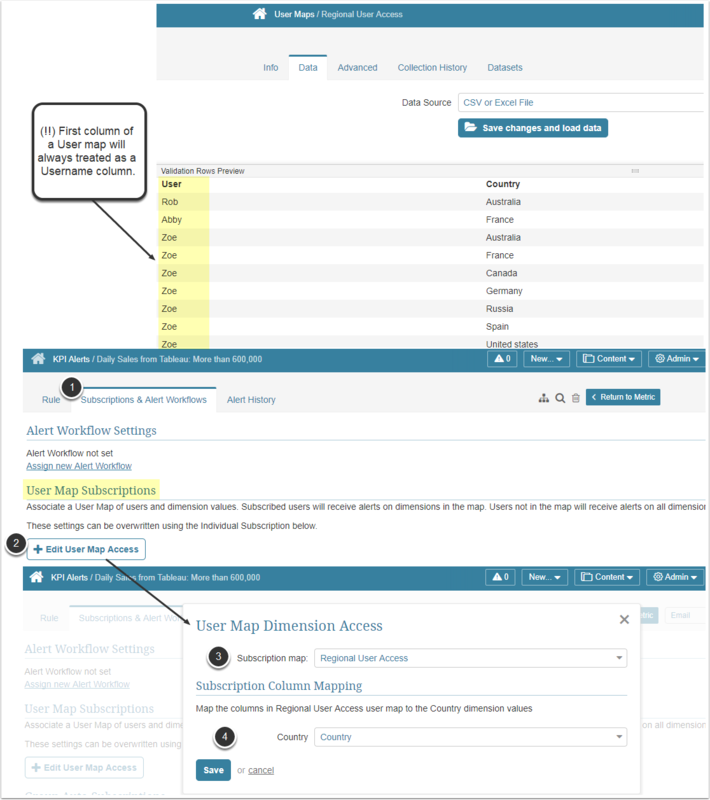 Subscription map: Choose the applicable User Map from the drop-down list. NOTE: The first column of a User Map is always treated as a Username column. This field is shown only for Alerts which are applied to dimensioned Metrics and are named after a Dimension.<Dimension name>: Map a column in a User Map with dimension KEY values. 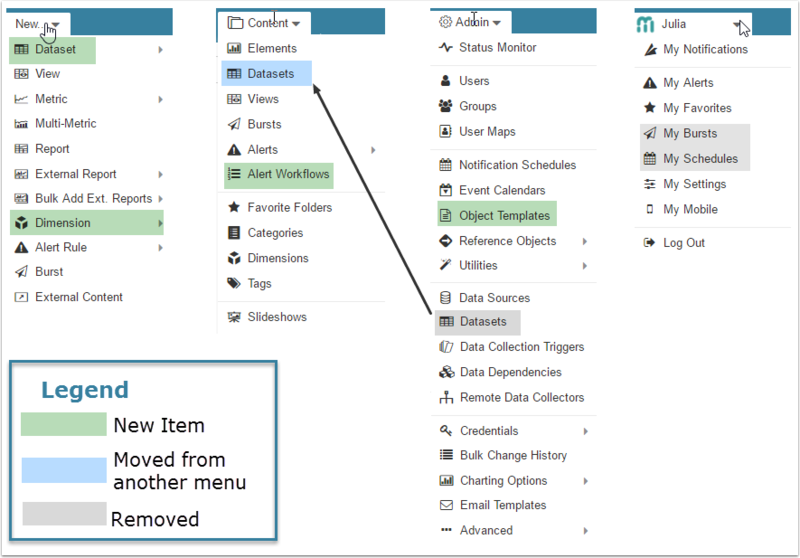 User Map settings override individual and Group subscriptions (both options defined by Admins in the KPI Alert Editor > Subscriptions & Alert Workflows tab) BUT are summed up with personal User subscriptions (defined independently by a User). 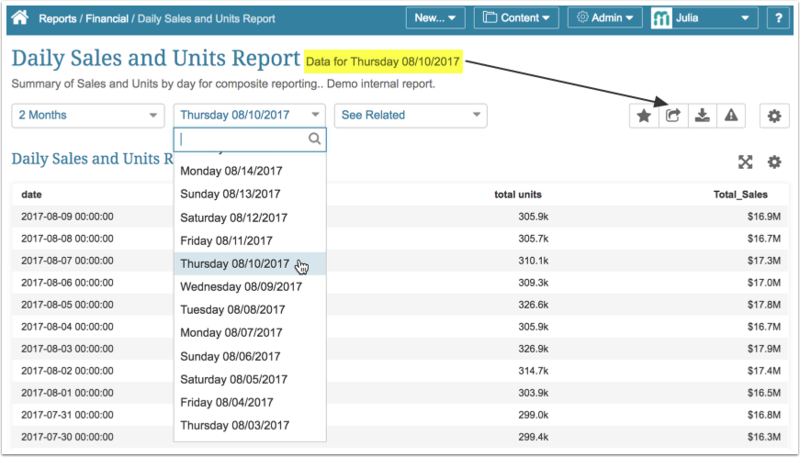 Same as in the previous Versions, you still have an ability to add Metric-based Alerts to Reports. Immediately via email: if this option is selected, a notification is going to be sent only in case there is going to be at least one new row in this Report. NOTE: Distribution schedules for these Digests are defined globally and cannot be changed according to personal User Preferences. For example, if Daily Notification Digest is set up to be sent "Daily (Every day at 0:00)" by the Admin, every User subscribed to it is going to receive it at the same time. But the content of such Email digest is going to vary depending on User's subscriptions to Reports and his scope of element access. Email addresses and email Templates can be set up in Notifications grid (at the upper right corner of the screen click your Username) > My Notifications. Subject line template: In previous versions 'Burst Name' was used as the email Subject. Starting in Version 5.1.1 you can construct the email subject and also define the date displayed. Custom header / Custom Footer: You can choose to include arbitrary text into custom fields and have that shown up as a header, footer, or both in the Burst email as shown in the picture above. A new setting for excluding repetitive anomalies from Standard Deviation and Moving Average has been added to the Metric Editor > Charting tab > Chart Settings. This feature is intended to allow improved anomaly detection by excluding anomalies from the standard deviation band calculation. This prevents an anomaly from suppressing anomaly detection on subsequent data points by significantly decreasing the size of the standard deviation band. Admins and Power Users have an ability to quickly create one or multiple metrics from a Dataset or some of its Views. It helps to minimize the number of data entry fields that are usually required to create a Metric. Choose a View: In the Dataset Viewer make sure that the right View is opened. Build a Metric: Access Actions > Build Metrics. A handy Visual Editor slides out. Define the Basics. Define the regular basic settings for creating a Metric. This is easily done by choosing the right column name from the respective drop-down list. The drop-down list for each field is populated with respect to the Column Type, for example, the Date column drop-down list will only be populated with the options representing date values. Moreover, since the Results set is always available below, you see exactly what you are adding to the Metric. This turns element creation process into a game: clear, fun and easy. Once you are done, click Add Metric. 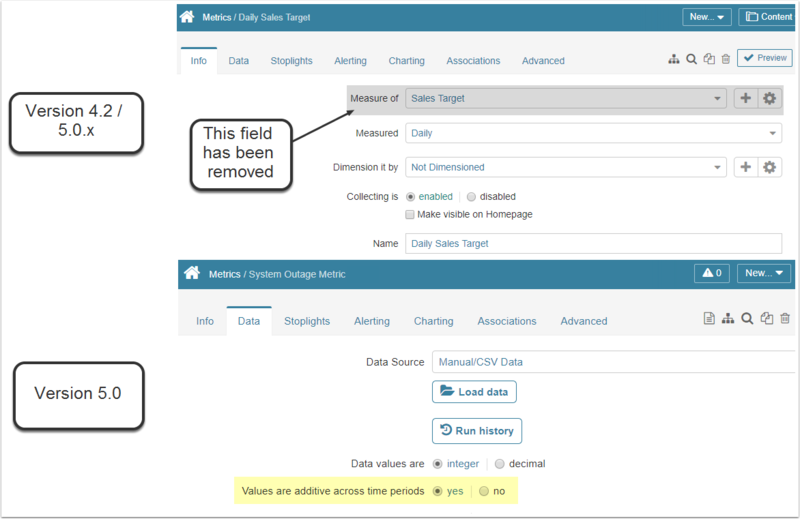 Multiple Metric Creation: You can create as many Metrics as you wish simply by changing parameters in the fields and clicking Add Metric. Each time you click Add Metric, a new one is added to the '# of Metrics defined' section in the middle of the screen. You can preview them in one click - the name of the Metric which is currently shown in the Preview is bold. Once you are ready to publish all of them, click Build All Metrics. Secured from Duplicates: All other Metrics previously sourced from this Dataset (any View) are also displayed here to help you avoid duplicates. Once you specified basic settings for all the Metrics you wanted to create, click Build All Metrics. An ability to create Templates for Metrics, Dimensions, and Datasets has been added. Let's review this on the example of a Metric. When you see the Metric that might serve as a good basis for multiple new ones in future, you can create a Template from it. All you have to do is go to its editor and at the top panel click a Template button. Next, you are going to be offered either to create a brand new Template or update the settings in one of those that have been created earlier. Each Template has the following setting in its Editor: Show in "New..." menu. If this setting is enabled, you go to New > Metric (or Dimension / Dataset). Next, you choose a Template by its name. NOTE: "custom" option represents a regular way of entity creation. What settings are automatically populated when using a Templates? In previous release (Version 5.0.5) this new Data Source has been added to the Report Editors. 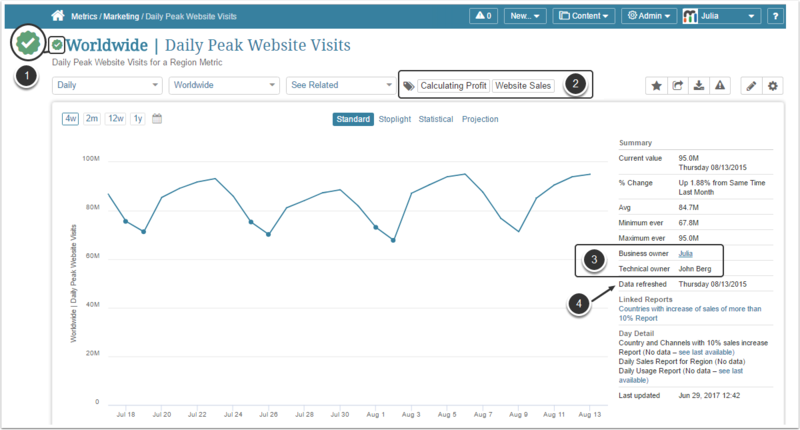 In this release its effect has been extended to Metrics in Metric Viewers. s. All Datasets created in the system are saved as SQL tables. 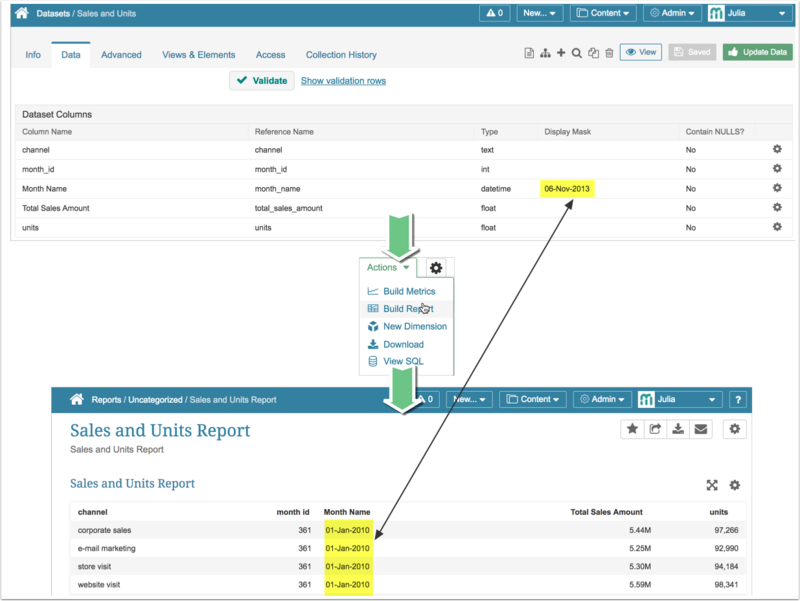 This functionality helps building Metrics and Reports that span multiple Datasets. In order to grant Power users access to this feature, a new Privilege has been added to User and Group Editors: Create Content Using Datasets. For more details refer to: Sourcing Reports / Metrics from "Existing Datasets - SQL"
A new option for comparing current value to the moving average has been added. In this case, current values are compared to default or custom moving average. To access the new setting, go to Metric Editor > Charting tab > Value Display > Show percent change from. The Data Preview drawer that shows sample result set has been added to the Report Editor. It allows checking out the Report content before publishing it. Depending on the Data Source used, the Data Preview drawer is opened by clicking Show data right after you generate a command or choose the Dataset View that should serve as a Report basis. In previous versions, when sharing a snapshot report via email, only the latest iteration of this report was sent by design. Starting from Version 5.1.1. the instance which is active in the report viewer at the moment of Report the sharing is going to be sent in the email along with a URL pointing to that specific historical instance. For example, if your Report is updated daily and today is Tuesday, but you open the Friday instance, the Friday instance is going to be sent when you share this Report. The Display Masks applied to numeric fields of a Dataset at the Dataset Editor > Data tab > Dataset Columns table are automatically applied to all Reports built from this Dataset. We are gradually improving design and functionality for Pivot Tables which can be created for any Report at Report Editor > Report Content tab > Report Tables and Charts > + Pivot. Dimensions: Sourcing Reports from "Existing Datasets - SQL"
A new Data Source has been added to the Dimension Editors. All Datasets created in the system are saved as SQL tables. This functionality helps to build Dimensions that span multiple Datasets. NOTE: In order to grant Power users access to this feature (create Metrics / Reports / Datasets from the "Existing Datasets - SQL" Data Source), grant this user a Privilege via User or Group Editors > Create Content Using Datasets. For more details refer to: Source a Report from "Existing Datasets - SQL"
A new mechanism for defining dimension access has been added to synchronize it to a User Map. When users create a Dataset based on a User Map and then subsequently create Dimensioned Metrics from the Dataset using the same columns as are in the User Map, the Dimension security model can be defined via the User Map and have that information automatically synchronized with the user/dimension access mapping so that no manual access re-assignment is required. 1. 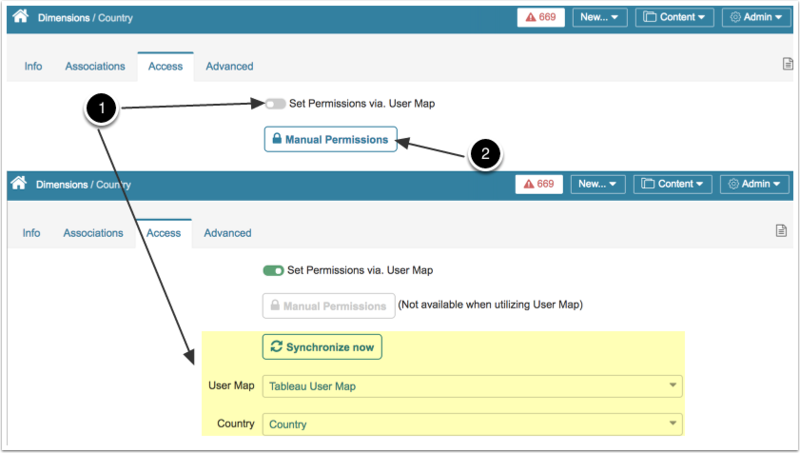 (Introduced in 5.1.2) Set Permissions via User Map: This option chnages page content dynamically allowing you to define a User Map from the drop-down list and Synchronize users who should be granted access to this Dimension. 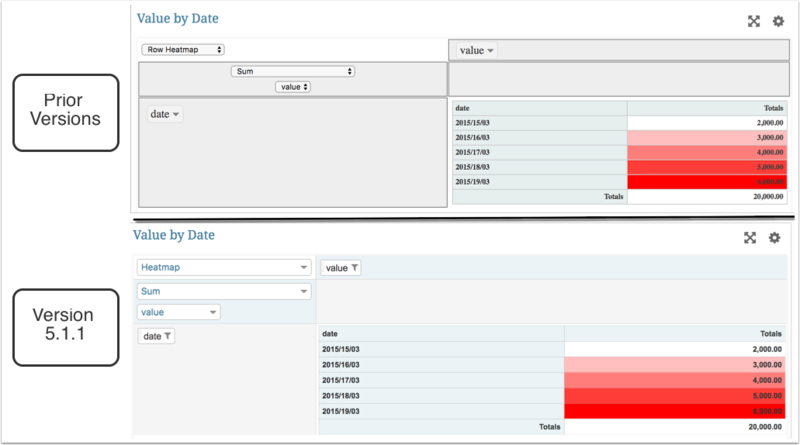 In versions prior to 5.1.2, Metric Insight offered an ability to add a Metric View for a Total Dimension Value. For example, a "Country" Dimension could include a "Total" Value that aggragated data for all countries in this Dimension. This functionality allowed generating a unique Metric View and analyze the changes the cumulative data per all Dimension Values. Starting from version 5.1.2 this functionality is also available for Dimensioned Reports. How to enable this functionality? NOTE: If a Dimension has to "Total" or "Subtotal" Value, this functionality is unavailable. (default option) Do not generate a report: no view for the Total value is generated. NOTE: Upon clicking the object type, you are redirected to the object's source page. Filters can be added at Element Editor > Data tab. In previous Versions, the PowerBI plugin functionality was limited to creating External Reports (collecting image upon the Trigger). We've extended its functionality to allow you extract data from PowerBI Tiles and PowerBI Datasets. You can now create Metrics, Reports, and Datasets sourced from PowerBI plugin. Additionally, a Visual Editor has been added to the Microsoft PowerBI Plugin Editor > Data tab for an easy way of constructing Plugin commands. Instead of constructing a command manually, a Visual Editor fetches all available fields from the source system, so all you have to do is choose those fields which are needed for collecting the data you are going to need for this element. Filters: We are gradualy updating all Metric Insights pluging with the functionality allowing to pre-filter the source data. 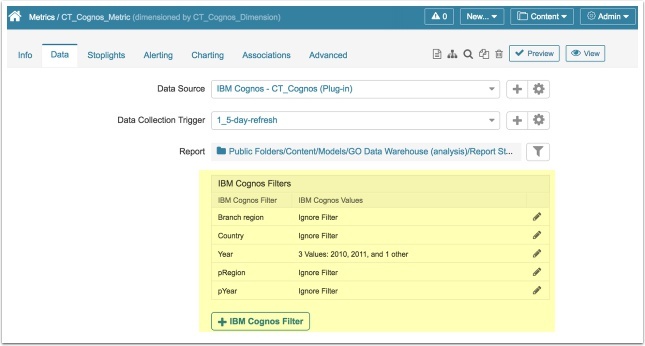 In Version 5.1.2 this feature became available for Cognos and Business Objects. 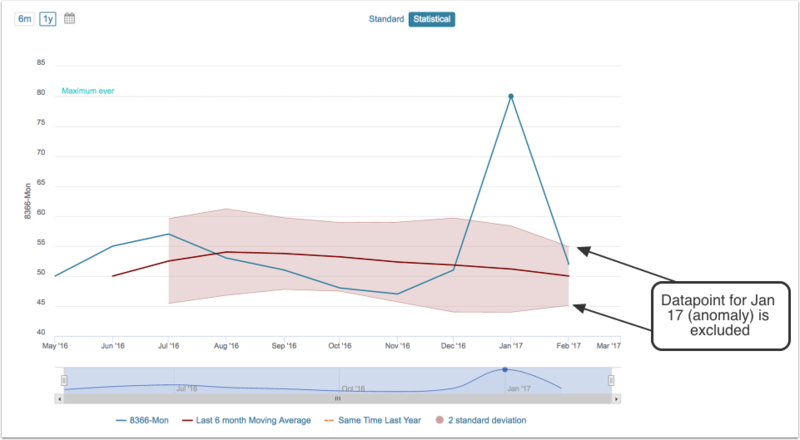 Embedding visualizations into regular Reports: In the versions prior to 5.1.2, we offered an ability to include external charts using links to other objects with an ability to adjust width and height of External Image. 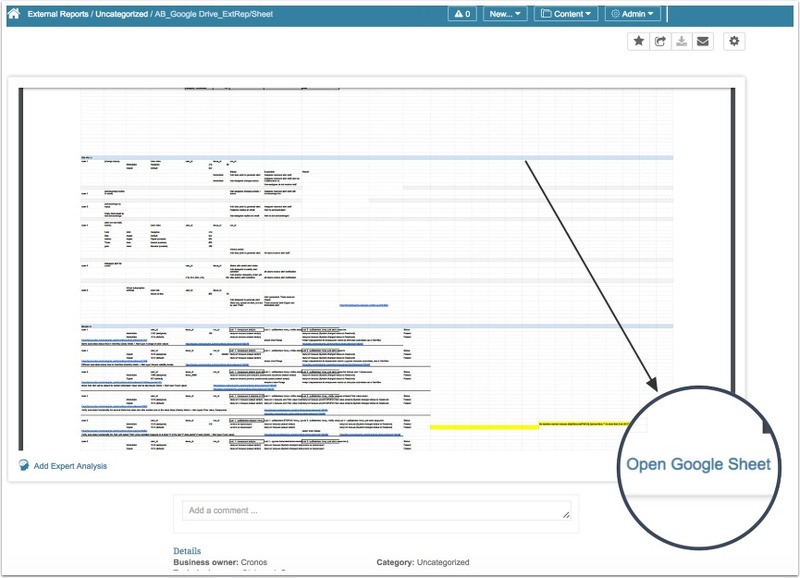 We have extended this functionality and it is now possible to combine Internal Report of any source and Cognos ot Business Objects Visualizations in a single Viewer. When configured with Bursts or Alerts, these mixed data can be delivered to users by email. Our plugin collection has been expanded with a new Google Drive plugin. You can access your google drive files directly from Metric Insights. 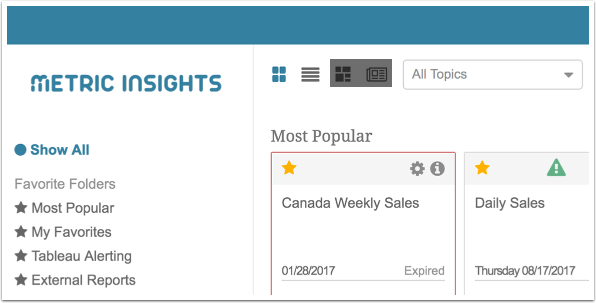 Create a plugin in Metric Insights. 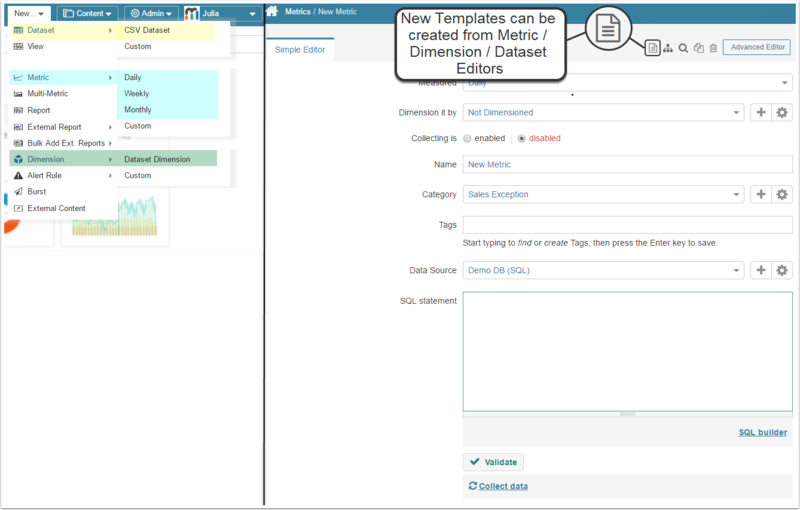 Datasets and Dimensions can now be created from the Templates or in a regular way by choosing the "Custom" option. Access to the full list of Datasets created in the system has been moved from the Admin menu. Object Templates is a new system function. Access to the full list of Datasets created in the system has been moved from the Content menu. My Schedules item has been removed as well. The process of Burst creation allows defining a personal distribution Schedule. In other cases, new Schedules are created by Admin users at Admin > Notification Schedules. Bursts can now be created from the New menu. All created Bursts are available in My Notifications tab together with the Digests and other Notifications. My Schedules tab has been removed as well. The process of Burst creation allows defining a personal distribution Schedule. In other cases, new Schedules are created by Admin users at Admin > Notification Schedules. Filters: Filter options have been slightly rearranged in Version 5.1 but no significant changed has been made to the search/grouping logic. Data refreshed: shows the date of the last collected data point. The more elements you create, the better filtering options you should have for find them in a snap. You are now able to filter out the Homepage content down to multiple element Tags. If your Homepage is opened on a specific folder or Category, the Tags option list is going to be limited to those Tag options, which are assigned to the elements belonging to this folder/category. To access all available Tags through this drop-down list, choose the Show All view at the top of the Left Sidebar. Grid and List Views have been removed from the default Homepage settings. Only Tile View and List View are now available by default. SHOW_GRID_VIEW and set them to "Y". In previous Versions, Metric Insights Data Dependency feature was tied to data loading analysis specifically. For example, it could check whether < 70% of data is loaded, and if this condition was satisfied - stop any downstream processes. In Version 5.1.1 a new Date mode has been added for an easy scan aimed at determining whether the new data has been added. In this mode the system checks whether any new rows have been added since the last run, meaning whether there are any new rows with a newer date. If data dependency is satisfied, the trigger runs and this new data is added to the elements. If data dependency is not satisfied (there are no rows with newer dates), the trigger doesn't run and the elements are not updated. The "Measure of" setting is no longer required for creating system elements. It was used to identify what is being computed in a Metric or Report (for example, Revenue, Sales, Orders, Customers, etc). Instead, Metrics can be designated as additive or non-additive across time periods. This setting is available at the Metric Editor > Data tab. Metric auto-naming. A user should compose a descriptive name while creating a new Metric. The name is defaulted to 'New Metric (nn)' where nn is next consecutive number. The See related drop-down list in the Metric Viewer is now populated differently. This drop-down now includes elements linked with this Metric by Tags only (formerly, Topics). Metric's Associations (defined at the Metric Editor > Associations tab) do not include elements united by the shared measure criteria. Measurement Interval (daily, weekly, etc.) is now a key criterion. Sharing Annotation with other Metrics, which was based on Metrics' Measures is not available anymore. Event Calendars can be applied to Metric Charts individually, by adding Tags or to Categories. The Status Monitor page provides details on how well your Metric Insights system is functioning. The Import / Export Utility is a tool to push elements and their related objects from one Metric Insights instance to another. Due to introduction of Datasets and User Maps, Import / Export Utility has been upgraded to interact with the new system entitties and bacame more robust and intutive. 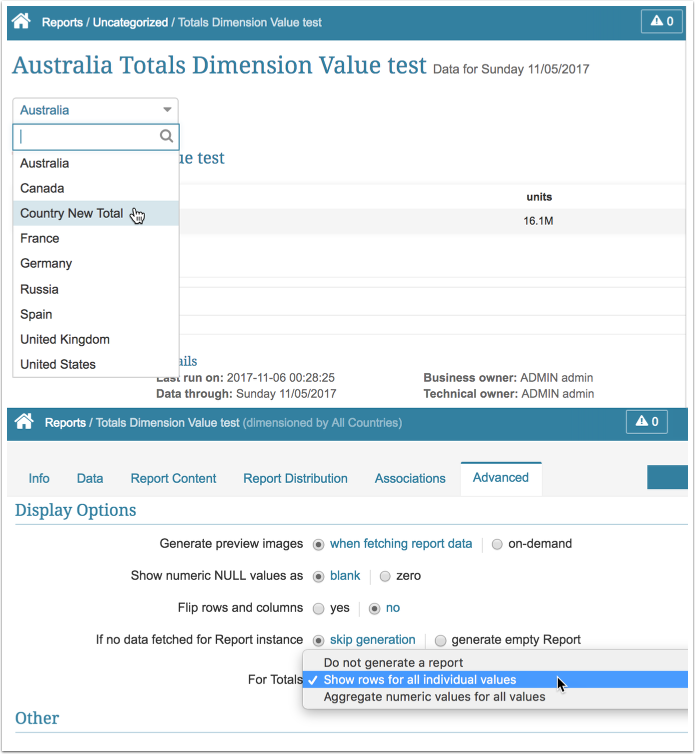 NOTE: Whenever a user chooses a Report or a Metric sourced from a Dataset to the export package, the original Dataset is automatically added to the export package as well. This automated procedure eliminates the data loss probability. My Alerts Assigned The alerts which are assigned to the profile owner and expect his action. My Subscriptions Subscriptions All the Alerts to which the user is subscribed to. All Alerts Triggers All alerts that were triggered in the system. Logo file was being deleted after upgrading to a new Version. The ampersand sign (&) was not showing properly in the Search field. The Element was downloaded for the wrong time period after double-clicking Download data at the upper right corner of the screen. Highcharts custom chart Axis Titles were not showing properly in earlier versions.